Weight plates are metallic units weightlifters use to add weight to barbells and dumbbells. If you would like to paint your weight plates, you must employ specific preparation and application strategies. If your weight plates are rusted, coat them with a base primer or rust will return. In addition, because these plates will endure a large amount of force from dropping and clinking together, choose a finish that will remain durable under duress. Move the plates outdoors or into an open garage. Remove rust from the weight plates using 80-grit sandpaper. Skip this step if the plates are free from rust. 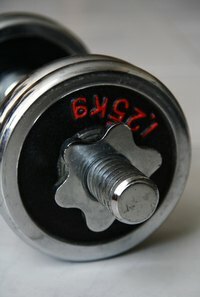 Wash the weight plates with a water-based degreaser–using a coarse plastic brush. Rinse the weight plates with a water hose. Dry the plates with towels. Place the plates on heavy-duty fabric drop cloths. Coat the clean weight plates with galvanized metal etching spray primer. Hold the can 8 inches from the plates as you apply. Wait six hours for the primed plates to dry. Coat rusted weight plates with iron oxide spray primer. Hold the can 8 inches from the plates as you apply. Wait three hours for the primed plates to dry. Skip this step if the plates are not affected by rust. Coat the primed weight plates with an oil-based spray enamel. Apply the paint as you did the primer. Wait 12 hours before using the plates. Don't use latex primers and paints, as they will not provide adequate durability. Never paint bare weight plates or the paint will peel.